Eight days ago, in Jiangsu China Reports 1st Novel H7N4 Human Infection, China announced the first known human infection with avian H7N4 which resulted in a 3-week hospitalization for a 68 year old woman in Jiangsu Province for severe pneumonia. In 2003 a large outbreak of H7N7 (89 confirmed, 1 fatality) in the Netherlands – with nearly all reported cases having very mild (often just conjunctivitis) symptoms. The Fraser Valley H7N3 outbreak of 2004 resulted in at least two human infections, as reported in this EID Journal report: Human Illness from Avian Influenza H7N3, British Columbia. In 2006 1 person in the UK was confirmed to have contracted H7N3, and the following year, 4 people tested positive for H7N2 – both following local outbreaks in poultry. In 2012, HPAI H7N3 was associated with two minor human illnesses (see MMWR: Mild H7N3 Infections In Two Poultry Workers - Jalisco, Mexico). 3 mild cases in Italy in 2013 (see ECDC Update & Assessment: Human Infection By Avian H7N7 In Italy). And in December of 2016, a veterinarian caring for sick cats at a NYC shelter was mildly infected (see NYC Health Dept Statement On Human H7N2 Infection). After the wake up call from H7N9, when a severe human infection with a novel H7N4 virus is reported from China, we naturally take notice. Today, in addition to releasing their Recommended Composition Of 2018-2019 Northern Hemisphere Flu Vaccine, the World Health Organization has released a new Antigenic and genetic characteristics of zoonotic influenza viruses report for February 2018. Included is the following excerpt on the recently reported H7N4 virus, which shows that this virus is a purely avian LPAI H7 strain - distinct from A(H7N9) - although it carries the PB2 637K marker associated with mammalian adaptation. The first human case of influenza A(H7N4) virus infection was reported by China. The case was from Jiangsu province, and the individual developed severe pneumonia and survived. The throat swab collected from the patient tested positive for A(H7N4) by real-time RT-PCR and sequencing. The individual had slaughtered chickens prior to illness onset and LPAI A(H7N4) viruses were detected in ducks and chickens on the premises. None of the close contacts of the infected individual reported symptoms and all tested negative for influenza. Viral gene sequence analysis generated from clinical material showed that all segments of the human virus shared high identity with wild bird avian influenza viruses. The HA gene was distinct from the A(H7N9) viruses circulating in China and was characterised as low pathogenicity by HA cleavage site sequence. No mutations associated with reduced susceptibility to neuraminidase inhibitors, amantadine or rimantadine, were found. The PB2 carried the 627K marker associated with mammalian adaptation. Virus has not been isolated from the infected individual. Based on the current antigenic, genetic and epidemiologic data, no new CVVs are proposed. The available A(H7) CVVs, excluding A(H7N9) CVVs listed above, are listed in Table 6. Whether this is a one-off event, or the first hint of a new emerging threat, is impossible to say. 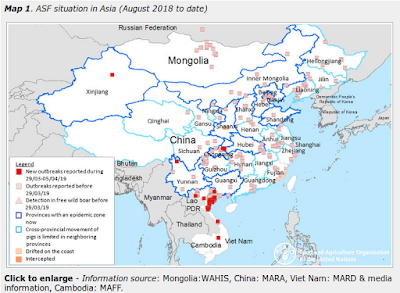 But the fact that this isn't a reassortment of the already endemic, and highly dangerous H7N9 virus is probably a good sign.